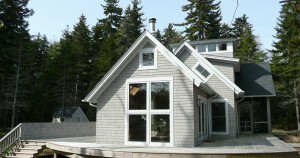 There are many different ways to get going with the new custom home building process. Often, people come to us with a general idea of what they want, but no construction documents. We are always in favor of having an architect involved, but that’s not for everyone. Nonetheless, someone needs to get your ideas out of the daydream state and on paper! You may be at the very beginning, or somewhere closer to having a conceptual design, or maybe you have a concept and need help with design development, but somehow we need to get the construction process rolling with construction documents. A designer or draftsperson can help, usually at a lower price. But this is one of those instances where you get what you pay for. Architects are highly skilled designers and this shows in the overall design, whether its scale of space, relationships and flow between rooms, color, light, proportions, et cetera. You know it when you see it, and if you don’t know it, your brain subconsciously does! OK, let’s skip ahead and now you now have some plans and specifications that we can start talking about. We love to get involved with the initial discussions, as early as possible. We’ve found that an early relationship with the client, architect, and builder, all at the same table closer to the design phase, can keep surprises to a minimum and add value in several ways. As a custom home builder, our involvement in the design development process can have a positive effect on value engineering(and cost/benefit analysis), design and its impact on construction, and material selections. As builders, our principal method of compensation is through the construction contract, but in this early phase we often act as consultants to the clients and architects. It’s often enough work that we put together a Pre-Construction Services Agreement, which allows us to be compensated for our time before construction, and covers our costs in the case that, for whatever reason, the project doesn’t make its way to our production schedule. Once a suitable budget has been agreed upon that relates well to the design drawings and specifications, we create a detailed cost worksheet that is referred to throughout the construction phase, and can be used to secure financing if necessary. This becomes the basis for the construction contract, and we’re one step closer to construction! Construction documents in some form are necessary to break ground on the project, and it’s not hard to understand how a custom home builder can deliver a better product to the client if most of the planning and design has been taken care of and is well detailed in the plans and specifications. Floor plans, elevations, cross sections make up the basic plan set. Schedules for plumbing, lighting, doors and windows, paint, the list goes on. All need to be arranged in some manner before the work can be done, and the earlier this happens the more control the client will have when it comes to cost and selections. Construction plans and specifications from the architect or designer, and a budget from the builder. These are the key ingredients that are crucial to have in place and in good shape before any good custom home building project gets underway with construction. Please feel free to drop us a line if you have any questions, or are ready to get a move on your project!